California weddings. portraits. adventure. love. life. I’m thrilled to share these engagement photos that we did on the American River near Paradise Beach. Kristina contacted me and had a vision of what she wanted. Whimsical, fun, and dramatic engagement photos. I was not about to let her down! I recommended one of my favorite American River locations in east Sacramento–Paradise Beach! They had a little over an hour drive to get here, but they were definitely game. This river spot is nice and wide open, as well as having some secluded areas with a lot of cool vegetation (also nice for changing wardrobes). So…I met Kristina and Jeremy (and their adorable Yorkie) a bit before sunset at Glenn Hall Park, packed up the wagon and headed over the levee and out to the river. We had so much fun finding spots and creating fun photos for their engagement shoot. The sunset was perfectly warm and cast a nice glow over the area. Kristina and Jeremy were very excited about their photos and couldn’t be happier. Congratulations Kristina & Jeremy! So glad I could share this experience with you and show you some beautiful areas in Sacramento! Best wishes to you two!! I’m a sucker for Lake Tahoe. Give me a view of the lake and I’m a happy camper. Not so much a “camper” in January after several feet of snow, but very happy to stay at the awesome Basecamp Hotel. The hubbs wants to go snow camping someday, but for now I will enjoy hot cocoa by the fire in the cozy (and well decorated) lodge. After dumping snow for days, there was a perfectly clear day begging us to go exploring. We happened upon this amazing meadow of freshly fallen snow that had a perfect foot path carved out for us. This area is for cross-country skiing and also has a little trail around the perimeter for us walkers (not to be confused with TWD...sorry just watched the new episode)! Anywho, I thought I would share a few pics from our little snow trip, just like I did last year…maybe this will become a tradition! I’d love to hear from you! Comment here or head over to my website for much, much more! I love Lake Tahoe weddings! 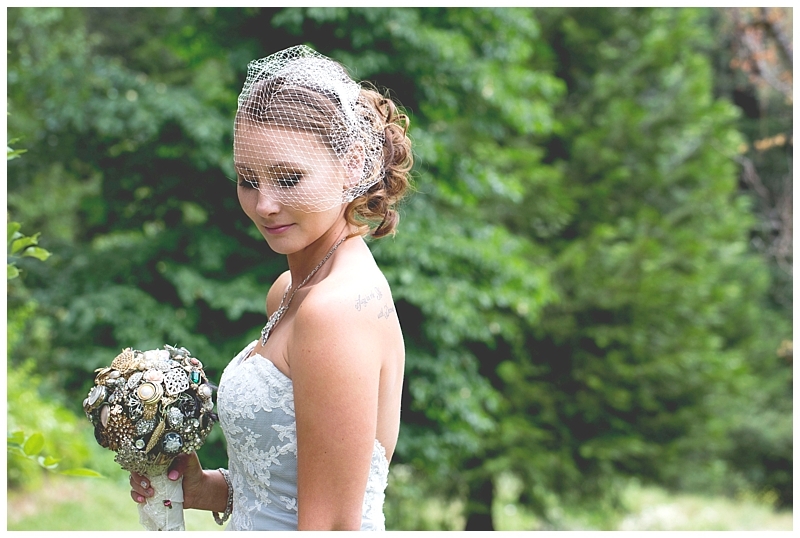 This was a south shore wedding at the Beach Retreat & Lodge taken along side my buddy Josh of Josh Gatlin Photography. I think these photos speak for themselves as to what a great lake front spot this is! It was a gorgeous day in Tahoe, and everyone had such a great time. Sneaking away with Kristin and Chase to walk out to the end of the pier was the icing on the cake and these two had no trouble creating chemistry for the photos…i’m not sure if they even noticed we were there! We finished just in time…the wildfire smoke was coming over the mountains. As you can see in the last photos, the smoke from wildfires started creeping in on the lake as we were finishing up the bride and groom portraits out on the peer. There were many firefighting crews from all over California coming to fight the blaze. These two sisters and their dad took time to thank the fire crews for all their hard work! It was really a cool thing to see. We all love Lake Tahoe and are thankful for those who protect it! Kristin and Shawn met me in the little old town of Folsom, CA. I was glad to see them again and also excited to chat about their upcoming Mission Ranch wedding in Monterey! We had a relaxing jaunt around Old Folsom, which is a beautiful area right along the American River. The Folsom historic district, Folsom Powerhouse State Park , and Rainbow Bridge make great areas to hang out, sightsee or take photos! Engagement sessions are always fun, and these two make it really easy to take great photos that captured how cute they are together. Thanks Kristin and Shawn for choosing me to take your engagement and wedding photos. I wish the two of you a lifetime of happiness! Check out more photos HERE! Happy New Year! 2016 was a bit of a whirlwind for me (being extremely busy and personally challenging) but when I look back at some of my favorite 2016 photos, I can’t help but to be excited about the joy and love that I captured for my clients. And I must say, I have amazing clients! Each one is special to me and I’m lucky to have met everyone I did in 2016, as well as photographing those that I have known for years. 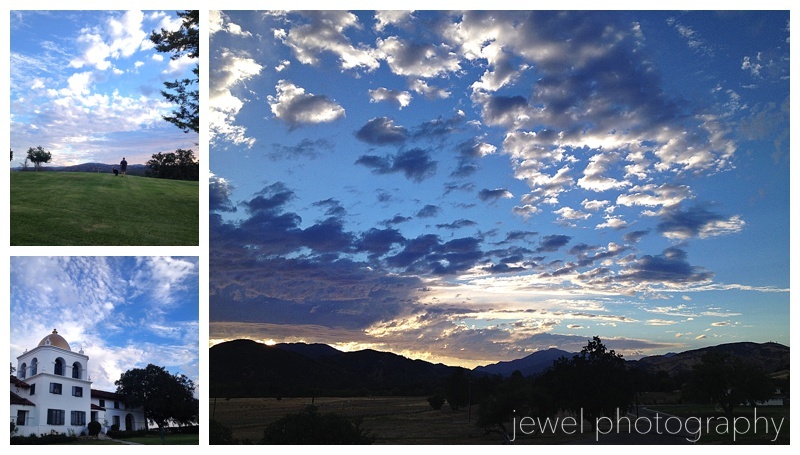 Speaking of being busy…I still have folders of photos patiently waiting to be put up on the blog. I was going to pick a couple of favorites from 2016 and show them here, however, it’s slightly difficult to choose a few photos from 55 folders! Instead I decided to recap the holiday family sessions using Blogstomp (a really cool tool for resizing photos to share on various social media platforms). Enjoy! Here’s to a wonderful 2017!!! 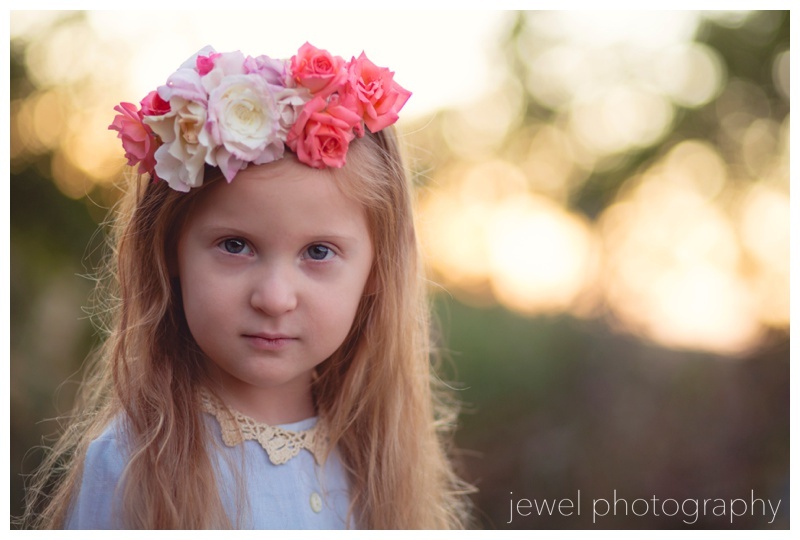 I hope you liked a little preview of my 2016 holiday photo sessions! 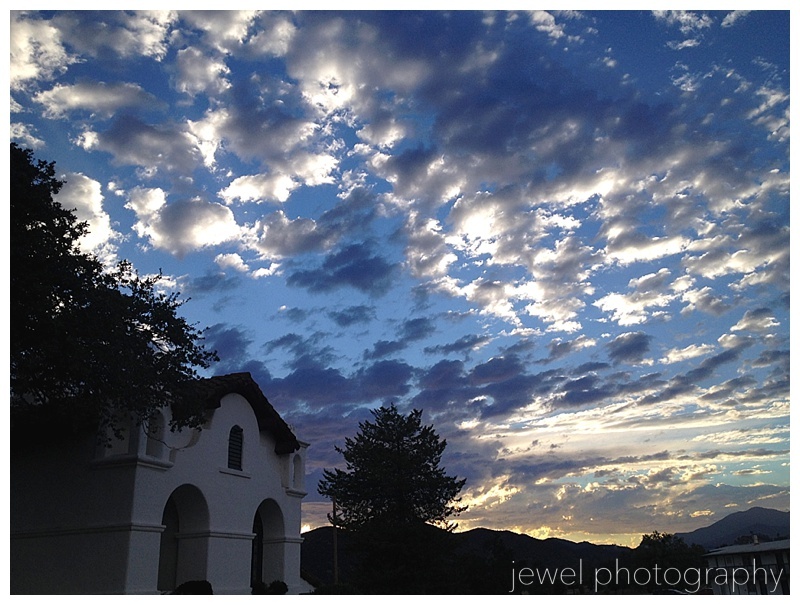 To see more of my work go to the Jewel Photography website. 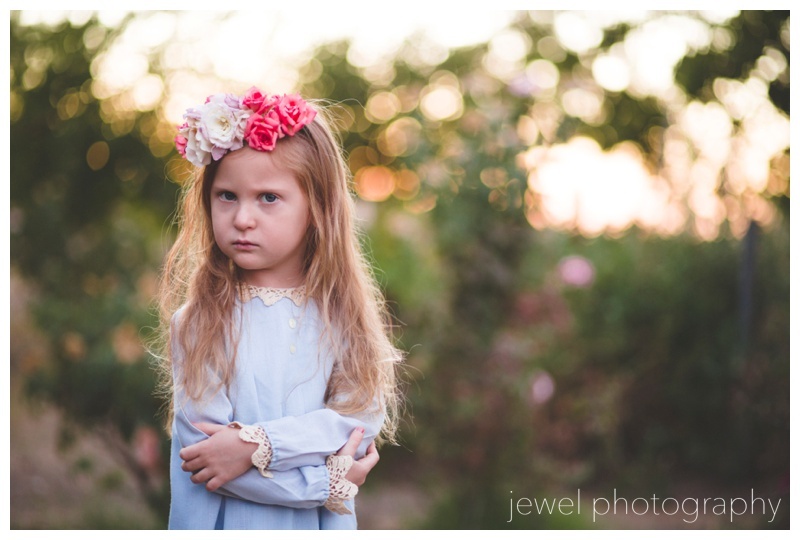 It’s never to early to think about family sessions, so drop me an email if you would like to set something up. I’m also booking weddings for 2017, so feel free to fill out the contact form on my website so we can chat about your wedding photography! Not too long ago, I drove up to the beautiful town of Foresthill to meet up with Staci and Shane. They thought it would be fun to come up to their wedding cite, the Grand Sierra Pointe at Forest House Lodge to take some engagement photos, and I loved the idea. We got to do a lot more exploring than we will be able to on the wedding day, so it was nice to take a look at the area surrounding the ceremony location. This place has the most awesome views! The drive up was so nice…on the way back, I just had to stop at the viewpoints to snap some photos of wildflowers that I caught a glimpse of on the way up. I am excited to see these two again at their Forest House wedding! It will be here before we know it! Till next time…check out my website HERE! Feel free to follow me on Instagram! And Twitter! And Facebook! I hold on to things for sentimental reasons. One of those things I have kept is a flower girl dress from a neighbor’s wedding I was in as a small child. My neighbor Janet was also my baby sitter and very good friend. 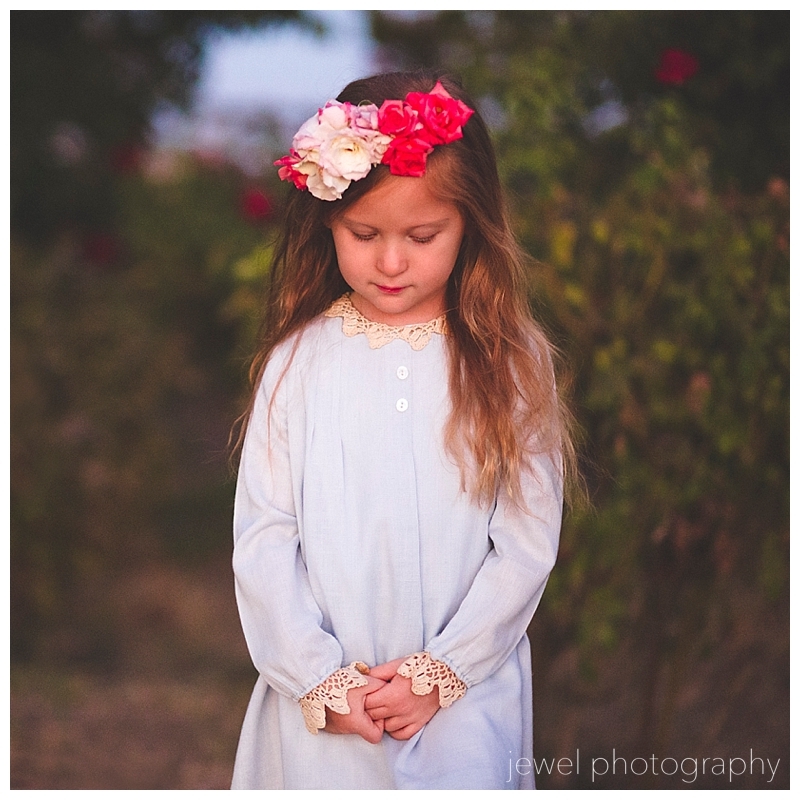 She had her sister make a soft sky blue linen dress for me with an antique lace collar and cuffs. I remember parts of the wedding at the historical courthouse building, and I remember the dress. 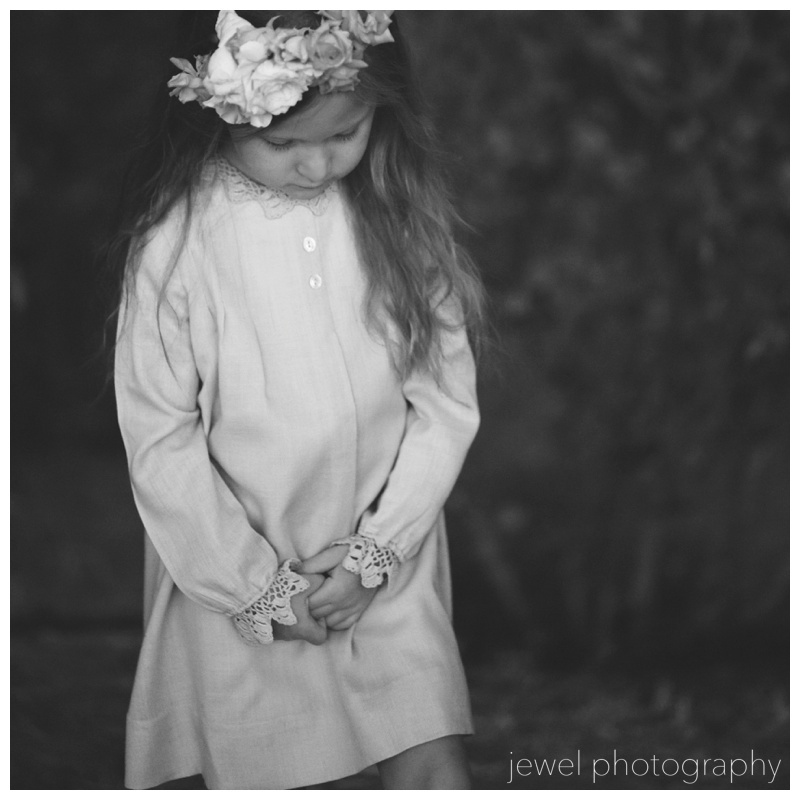 Being that my daughter is the same age right now, I thought it would be a nice tribute to have her wear my vintage 70’s flower girl dress. My neighbor still holds a very special place in my heart, so what better way to show her than to have my daughter wear the dress that I wore. 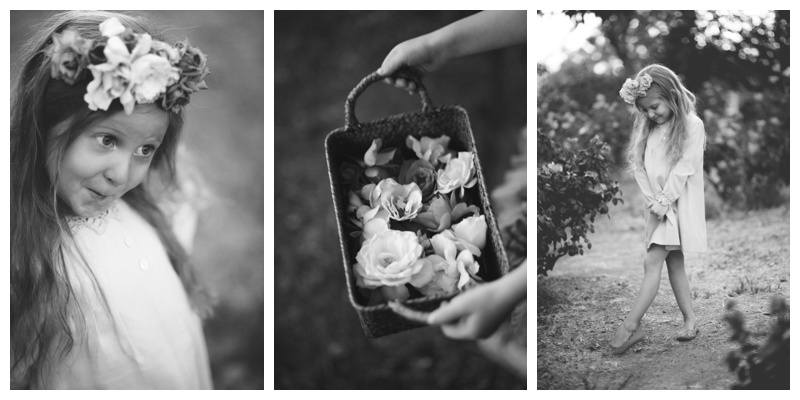 To top it off, we went to the house I grew up in to take the photos in my brother’s rose garden. 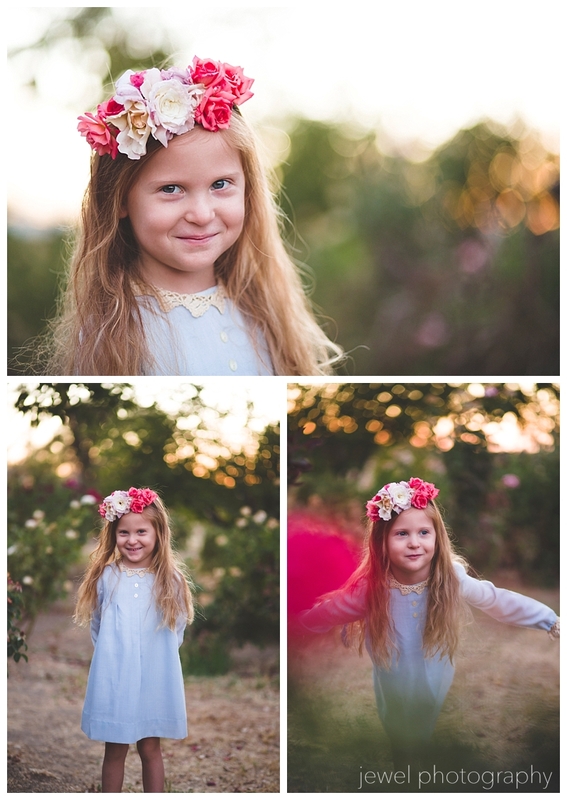 We made a colorful rose floral crown in pinks and whites. 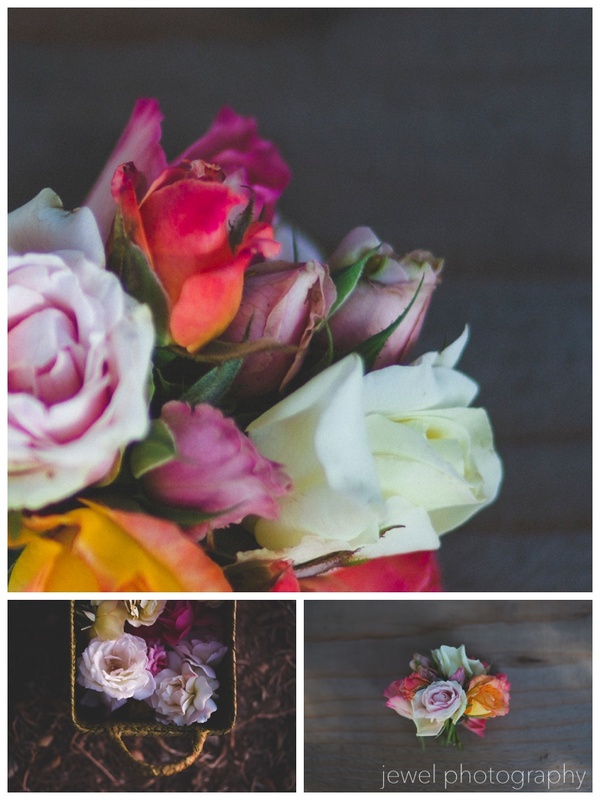 We also hand picked roses for her basket and a small bouquet. These photos are special to me in so many ways. Enjoy! Anyway, I have always had an affinity for roses. After all, they are a symbol of love. I also have a brother that is an avid rose grower and aficionado, who grows the most amazing roses. 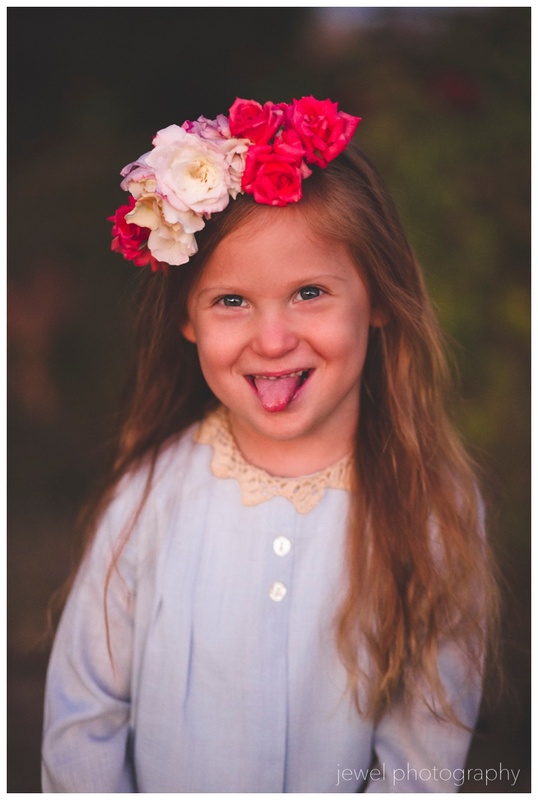 Just walking around collecting for a bouquet, flower crown, or vase full of roses will make your senses go crazy! All of the different smells and color pallets…pure heaven. 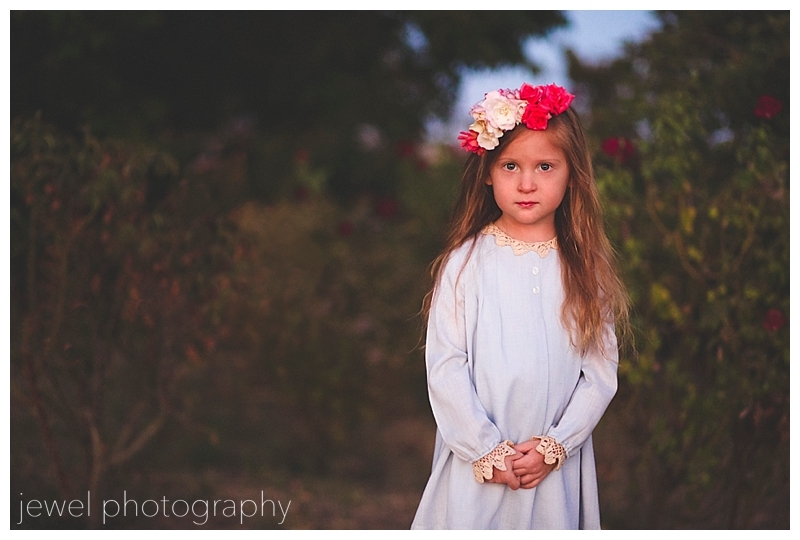 I recently did a photo shoot of my daughter in a vintage flower girl dress that I wore at her age when I was in a neighbor’s wedding. 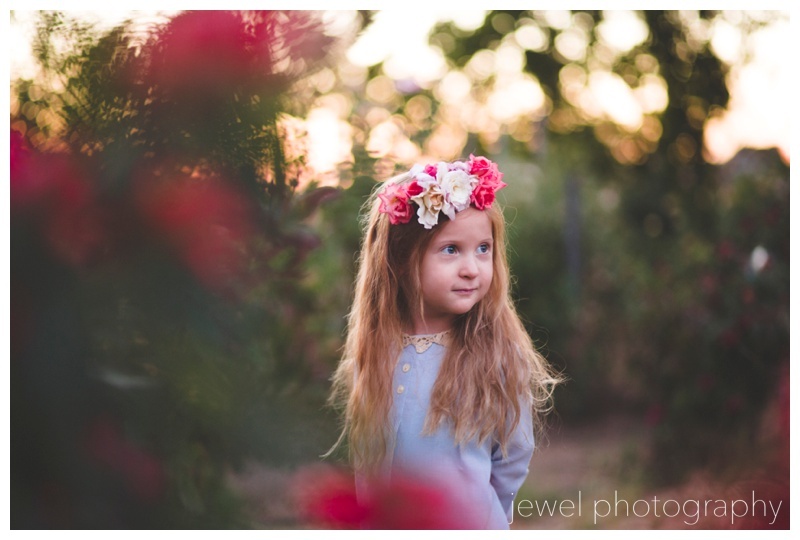 We took the photos in my brother’s rose garden. 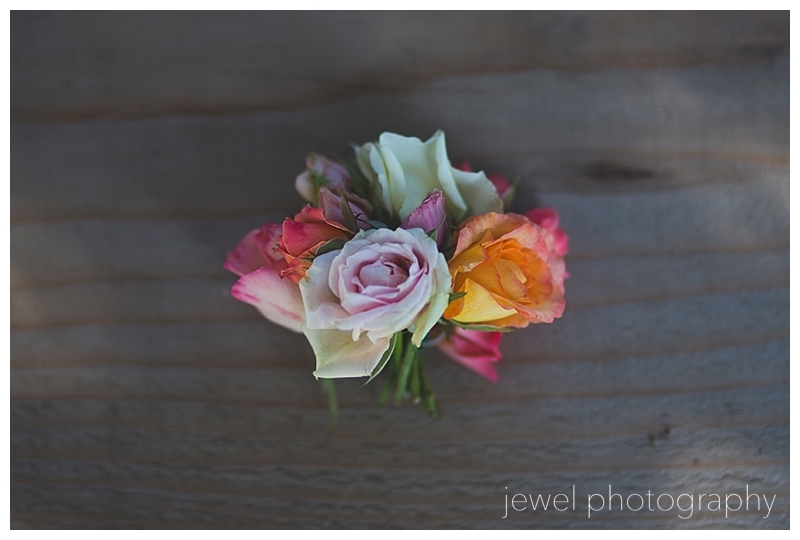 I made a small bouquet out of miniature roses and small rose buds from the leftover roses of her flower crown. 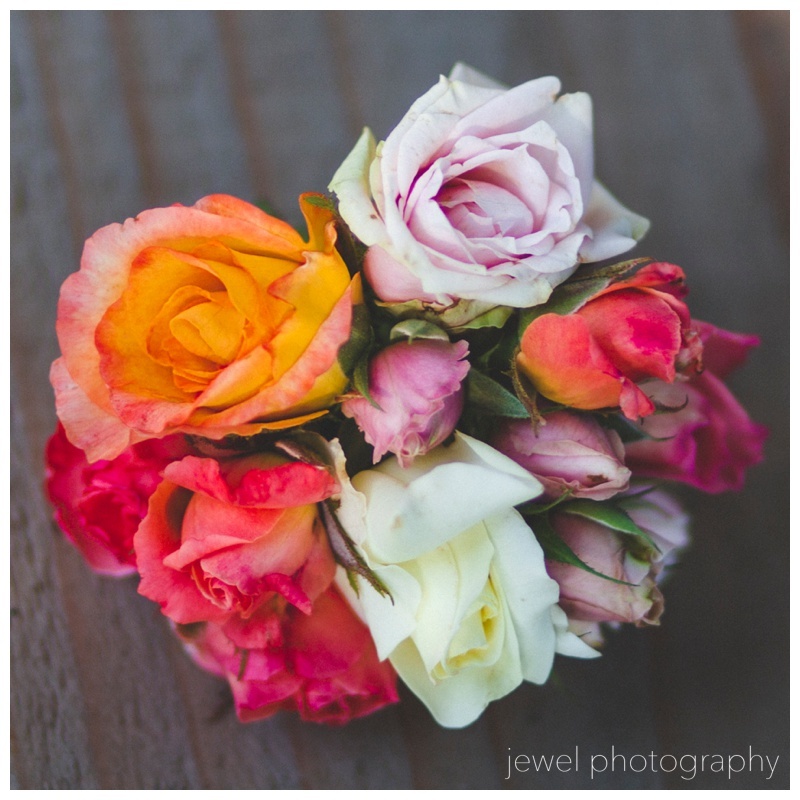 The colors, texture, and fragrance that roses emit is a very simple but wonderful pleasure! 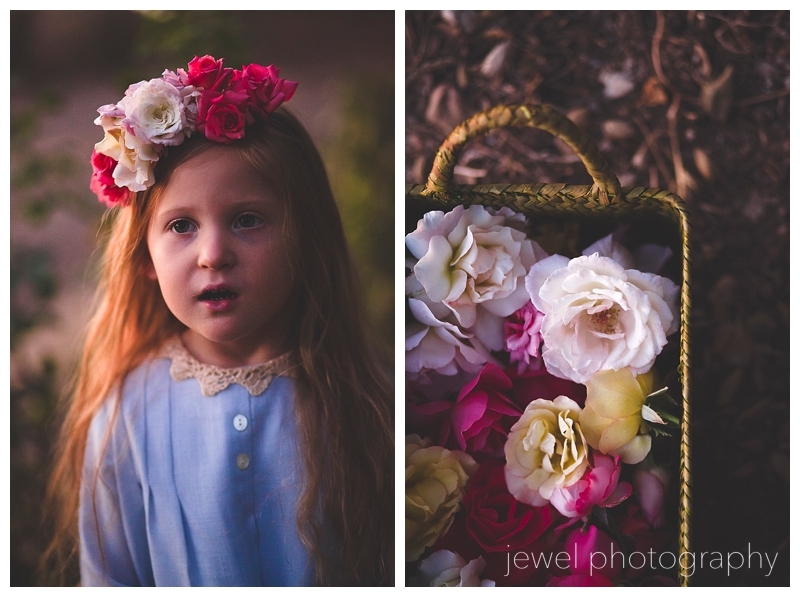 Stay tuned for my “flower girl” photos in an upcoming blog! My husband and I just celebrated our 10 year wedding anniversary(!) by taking a grandiose tour of the Central California Coast. We planned on camping in Big Sur, but so did a LOT of other people. At the site we were coveting (which had 5 empty but reserved spaces), we found a handwritten note on the “camp host” site (since they were not anywhere to be found) that said to go to a campground 12 miles inland where there was space. Well…it wasn’t exactly an easy 12 miles. It was a VERY narrow and VERY steep road that lead us to the most dry, boring, and bug laden campgrounds we had ever seen. We would have had the place to ourselves, but when it became obvious we would not be staying, my husband decided we may as well keep going because we were close to a military reservation that he has trained at in the past. So we kept on truckin’ and headed through quite beautiful untouched land. My husband assured me there would be a vacancy in the hotel and we would just stay one night, get our game plan ready and head out early in the morning. When he said I would love the place, I kind of thought, yeah, right…as I looked around at old buildings spread out in desolation. But he was right. I loved it. 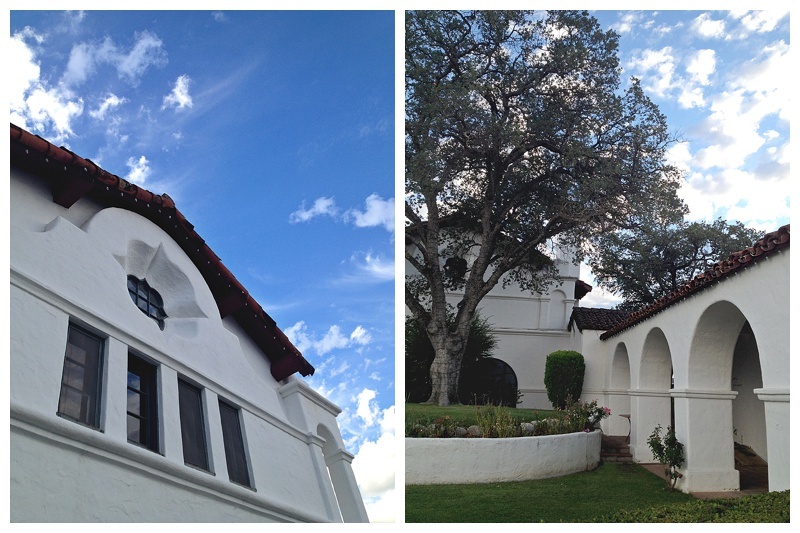 Nothing fancy, and far from civilization, but so neat to stay in a mission-style hacienda built by W.R. Hearst in 1930. 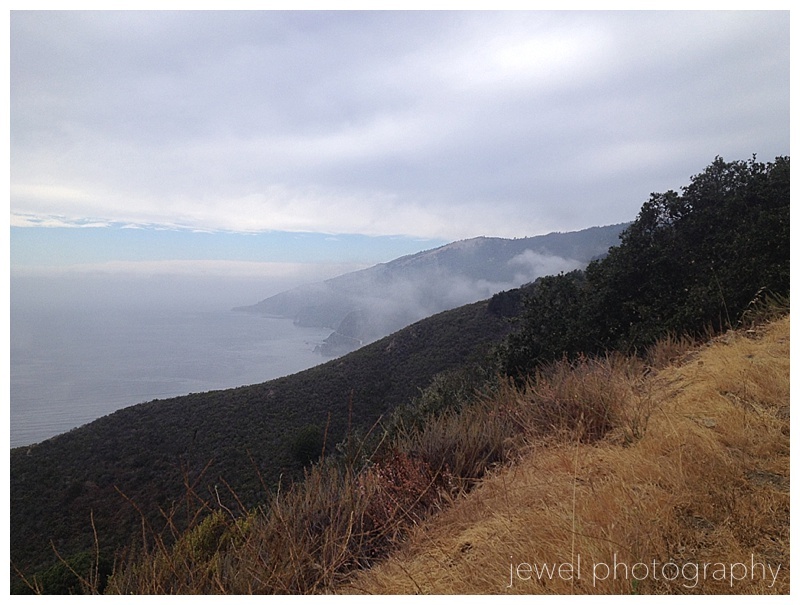 This was the view of Big Sur as we climbed up the steeeeep hill of winding road in search of a campsite. 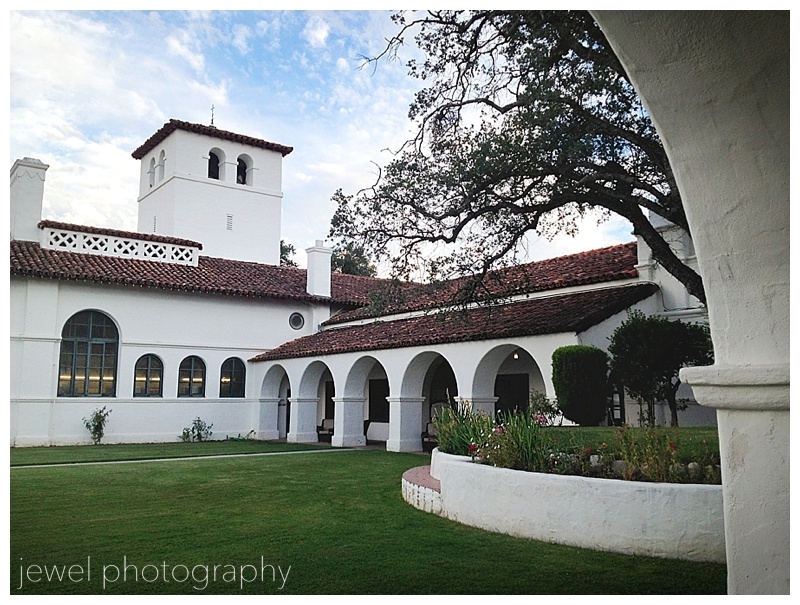 When we drive up to the lodging, to my surprise it was a beautiful Spanish Mission style building! 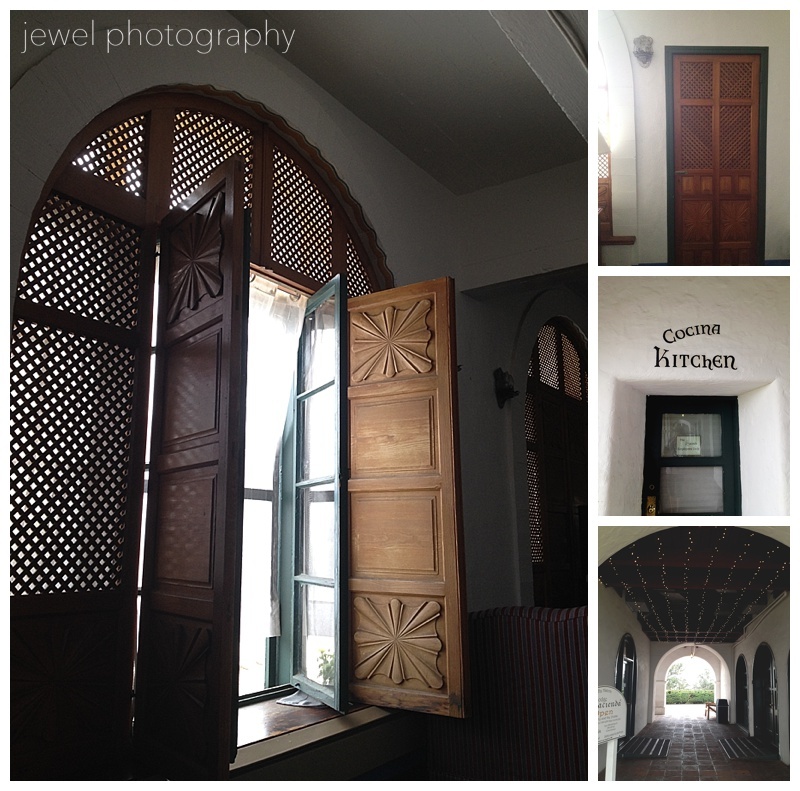 I absolutely loved the carved wood windows and doors. Everything had so much character. The more we walk around an explore the Hacienda, the more I love it. I can envision a wedding ceremony on this grassy hill! Back at our room, I couldn’t get enough of the details. They have kept it as historically sound as possible. The view from the Hacienda was pretty great as well. I think this sunset lasted for 2 hours. Not kidding. We will be going back to the Hacienda! It is very close to Moro Bay and San Luis Obispo (Hearst and his farm hands used to ride horses from here to San Simeon! ), and the great rates make it worth stopping on the way to your destination. 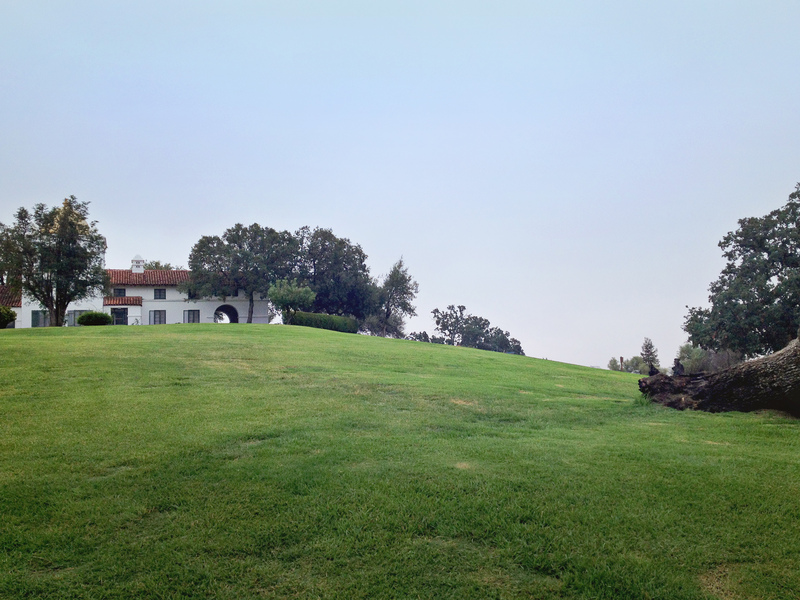 If you would like to learn more about the history of the Hacienda or have a destination wedding on their beautifully manicured landscaping overlooking the Santa Lucia mountain range, check out the pdf or the military website. It is open to civilians! These sweet children are a bit older now, but they still love each other! I will be doing an actual photo shoot with these two coming up soon, so stay tuned for that!